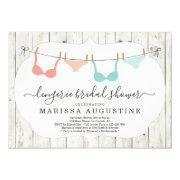 Find a fun lingerie shower invitation for your bridal shower. 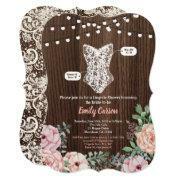 Pick out an amazing design and choose one of six invitation sizes. 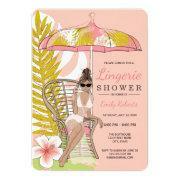 Order today and save 40% on your invitations. 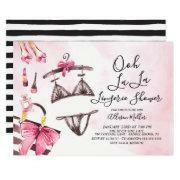 These invitation templates provide plenty of great ideas for both bachelorette parties and lingerie showers. 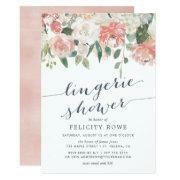 Choose from any of these customizable templates and create an invitation that suites the bride-to-be. 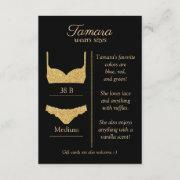 Add your own text, photos and designs and be confident that your card will look great. Enjoy vibrant full-color printing that brings out the best in your photos & designs. But there is more: Your order will be printed and shipped within 24 hours, so you don't have to wait. Orders ship from California, so you can rest assured you're buying American made goods. 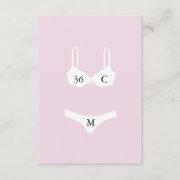 If that's not enough, there's no minimum order – celebrate as big of a lingerie shower or as intimate as you like without worrying about additional cost. This is another classic that many women will remember celebrating. It isn't known who started the trend but it provies the guests with a fun opportunity that may not be fitting in other types of bridal showers. 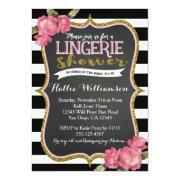 If you want to walk on the wild side (at least a little) then you may want to consider hosting a lingerie shower. 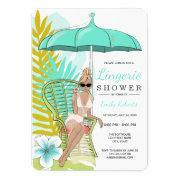 And if you do, then we have the fitting shower invitations for you right here.